Yes, I do. That might be it, then. Either way, I'll see how it looks with the spacers first and decide on what drop to go with afterwards (if at all). Figured I'd start with the smallest price-tag and work my way up. lol. Here's the rear with 12mm spacer installed, stock suspension. As you can see, there's still a significant tuck going on. I measured the wheel and it's 10.5" (OEM spec). Tires are also OEM at 295. 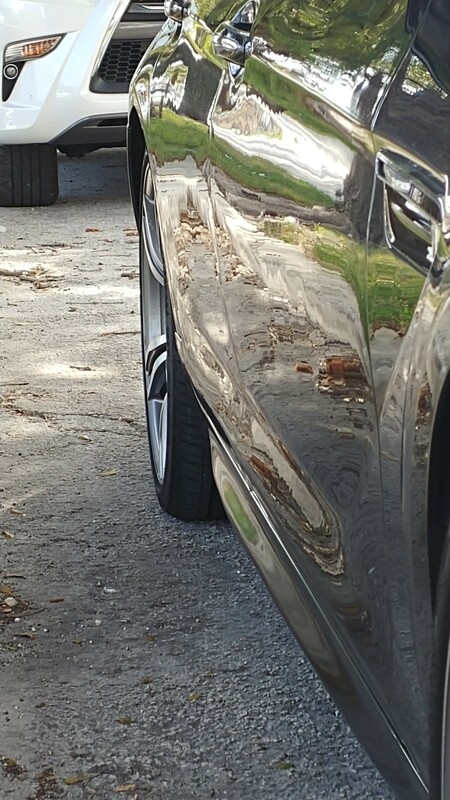 Could there be something else affecting the fitment? I'd hate to have to go 20mm+ spacer. Any advice on what else to look for/consider would be greatly appreciated. Installed 10mm in the fronts and they're perfect (sorry, no pic). No rubbing and aggressive stance. Spacers were use for 2months just siting on shelf now. . Anyone interested let me know. Selling for cheap. Will check for the size forgot off hand what they were. Last edited by frozenM6; 01-08-2019 at 12:53 AM. I think you're right on; not sure on the "real-life" offset, but this is a second-hand car with known wheel repairs, so very possible that the wheels were swapped out at some point. With that being said, wouldn't the higher offset cause issues with the suspension? Wouldn't there be rubbing on the spring/strut? Everything in the suspension is the same as the F10 M5 apart from spring rates so there shouldn't be any problems with physical fitment. You'd need a 15mm spacer just to get to stock specs. Also the M5 wheels are 10" and M6 wheels are 10.5" which very slightly stretches the tyre so even with a 15mm spacer you're still slightly inset from stock. The good news if your front wheels are correct (20x9.5" 31mm) that you'll only need to buy two wheels and then have a good pair of wheels that can fit anywhere on the car and can be used as a spare. If you check out one of my threads you'll see 20x10" M5 343m wheels on the front of my car with 295/30r20 tyres and they are absolutely fine over speed bumps and full lock. How did you measure the wheel width? Nominal wheel width is measured inside the lips. If you are measuring 10.5" from outside lip to outside lip, then it's probably more like a 9.5" width wheel. So this is 12 rear and 10 front? In regards to getting spacers, did you also change the studs or keep OEM ? I forgot to keep you guys updated. I installed 10/10. I was going to install 12 on the back but the 295 tires are actually 325 and than 12 would be too much.